Even though the world of advertising has become more and more competitive, the principle behind the ad copy remains the same. The four steps that the copywriters use in their ad to persuade the consumers to buy the products are attention factor, interest element, desire element and action element which is called as AIDA. Advertising and marketing objectives are met by the effective use of this model. The phrase AIDA, in marketing communication was coined by American advertising and sales pioneer Elias. St. Elmo Lewis in the late 1800s. The model talks about the different phases through which a consumer goes before going to buy a product or service. According to him, most of the marketers follow this model to fetch more consumers for their product. Marketers use this model to attract customers to purchase a product. This model can be seen widely used in today’s advertisements. The acronym AIDA stands for Attention, Interest, Desire and Action. These are the four stages that a consumer goes through when watching or viewing an advertisement. According to Lewis, first and foremost, the role of an advertisement is to attract the customers. Once an ad grabs attention, it has to invoke interest towards the product in the minds of the consumers. After creating an interest, the ad has to bring desire in consumers mind to use the product and finally the consumer has to take a favorable action towards the product by ultimately purchasing the product. An advertisements success depends up on the viewer’s ability to notice and understand its message. The AIDA model helps the copy writer to present the elements of a print ad, Headline, Subhead, Body copy, slogan and contact information in a format that makes the viewers read in a flow and understand about the product easily. 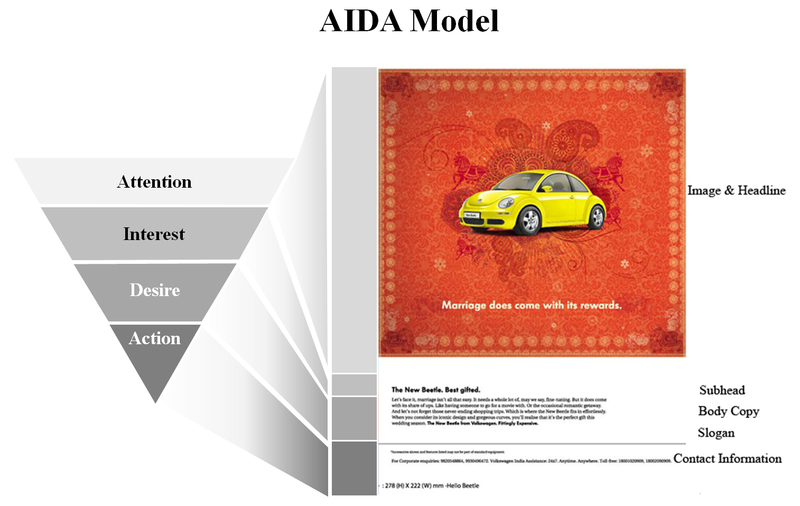 Given below is an example of an ad that has used AIDA model to present the message elements. In the given ad, the Headline “Marriage does come with its rewards” and the image of the car attracts the viewers attention. The subhead “The New Beettle, Best Gifted” creates interest in the viewers to know more about the product. The Body copy & the slogan given in the ad create desire in the viewers mind. The contact information given towards the end makes the viewers take an action. can AIDA model be used in knowing how to strategically use different communication channels? How can one use the Yale model in advertising?